Space-saving storage containers are great for multi-trip applications. Designed for storage of both hazardous and nonhazardous contents. Easy to fill, stack and load. Hot-dipped galvanized steel cage is consistent with Food Code requirements in non-direct food contact environments. Plastic Pallet base is designed for durability and structural integrity. Includes inner storage tank made from HDPE plastic with white UV-blocking additive. Includes 2" butterfly valve with Viton gasket. Top fill cap is 6" diameter with 2" bung. Complete unit is UN approved -UN 31HA1/Y. Transport Dry Bulk Materials With Ease! 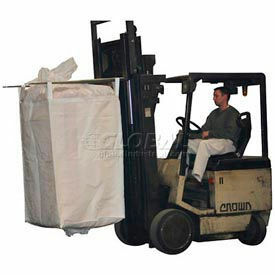 Fabric IBC Forklift Hopper Bag is made using polyester webbing coated with polypropylene for extra strength. UV treated for long life. Easily folds when not in use for storage. Offers 3,300 lb. capacity! Corners include lifting loops for easy fork lift attachment. Sold in packages of 5. 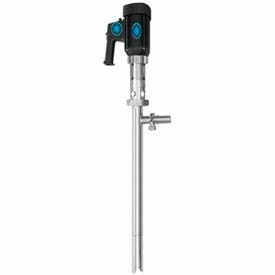 ScopeNEXT IBC Hand Pumps Are Used For Dispensing A Variety Of Liquids And Are Suitable For Use With Both Food And Hazadous Chemicals. 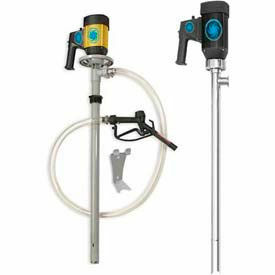 ScopeNEXT IBC Hand Pumps are made of polypropylene for long lasting durability. Features a dual action design for superior performance. Built-in check valves offer enhanced versatility. Low pressure nozzle ensures even distribution for added reliability. Closed-loop dispensing system provides added safety and protection for use with hazardous chemicals and substances. Can be easily disassembled for quick cleaning. Dispensing rate is 26 fl. oz. per stroke. 2 Year Limited Warranty. 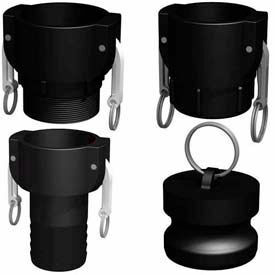 Spouts have a 2 inch female buttress and threaded connector with gasket for ease of use. Thread is 1 inch. Dispensing rate is 20 GPM. Suction tube diameter is 2 inch. IBC Adapters Are Designed To Accommodate A Variety Of Dimensions And Tolerances In Fitting Applications. IBC Adapters are manufactured from FDA food grade materials in strong glass coupled polypropylene under an ISO 9000 quality management system for long lasting durability. Material rated to 150psi and suitable for most chemicals carried in IBC Totes. Each adapter bagged and labeled for cleanliness and ease of identification. Types are Buttress Thread Adapter, Dust Cap, Hose Barb Adapters, NPT Pipe Thread Adapters, Part A Camlock, Part A Kingtainer Camlock, Part B Camlock, Part C Camlock, Part D Camlock and Schuetz Dust Cap. Available in a variety of styles, sizes and connections. Color is Black. IBC Easy-Seals Offer Fine Thread, Off-Load Adaptor Capabilities. IBC Easy-Seals are manufactured from FDA food grade materials in strong glass coupled polypropylene under an ISO 9000 quality management system for long lasting durability. Material rated to 150psi and suitable for most chemicals carried in IBC Totes. 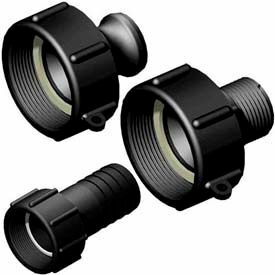 Available in a variety of male and female adapter styles to accommodate fitting requirements. Swivel ring allows easy assembly and prevents hose twisting. Each adapter bagged and labeled for cleanliness and ease of identification. Types are Hose Barb Adapters, NPT Pipe Thread Adapters and Part A Camlock. Connections sizes vary per type. Color is Black. IBC Swivel-Its Provides Swivel Ring to Allow Easy Assembly And Prevent Hose Twisting. 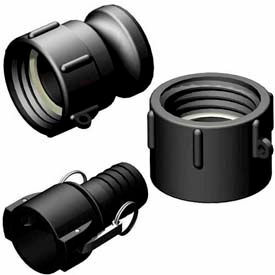 IBC Swivel-Its are manufactured from FDA food grade materials in strong glass coupled polypropylene under an ISO 9000 quality management system for long lasting durability. Material rated to 150psi and suitable for most chemicals carried in IBC Totes. One side of adapter is swiveling female nut allowing operator ease. 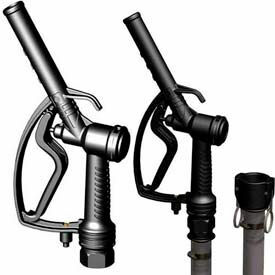 Unique swivel-it design eliminates difficult screwing when using long hose and pipe. Reducer from male buttress valve to female BSP fine thread. Each adapter bagged and labeled for cleanliness and ease of identification. Type is Female NPT Pipe Thread. Sizes are 3/4", 1", 1-1/4", 1-1/2" and 2". Color is Black. 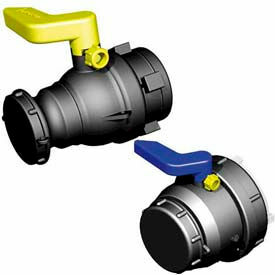 IBC Valves Are Available In A Variety Of Thread And Camlock Styles And Sizes To Suit Job Specifications. IBC Valves are manufactured from FDA food grade materials in strong glass coupled polypropylene under an ISO 9000 quality management system for long lasting durability. Material rated to 150psi and suitable for most chemicals carried in IBC Totes. Available in a variety of male and female adapter styles for use with for use with Schuetz, Clawson, Mauser, Greif, Mamor and old Hoover IBC's. Each adapter bagged and labeled for cleanliness and ease of identification. Styles are Valve with Male NPT Pipe Thread, Valve with Male 2" Camlock Part A, and Valve with Male S60 x 6 (2") Buttress Thread. Specifications and connection sizes vary per type. Color is Black. IBC Camlocks Are Used For Sealing Out Leaks In A Variety Of Closure Applications. IBC Camlocks are manufactured from FDA food grade materials in strong glass coupled polypropylene under an ISO 9000 quality management system for long lasting durability. Material rated to 150psi and suitable for most chemicals carried in IBC Totes. Available in a variety of male and female styles to accommodate fitting requirements. Each adapter bagged and labeled for cleanliness and ease of identification. Types are Dust Caps and Plugs, Part B Camlock, Part C Camlock and Part D Camlock. Styles, specifications and connection sizes vary per type. Color is Black. IBC Vents Are Used For Providing Anti Vacuum And Pressure Seal In Fitting Applications. IBC Vents are manufactured from FDA food grade materials in strong glass coupled polypropylene under an ISO 9000 quality management system for long lasting durability. Material rated to 150psi and suitable for most chemicals carried in IBC Totes. 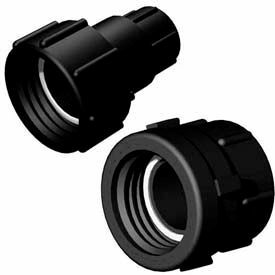 Available in a variety of male and female adapter styles to accommodate fitting requirements. Each adapter bagged and labeled for cleanliness and ease of identification. Styles are 2" Male NPS Threaded Dual Action Vent with 2psi spring and 2" Male NPS Threaded Dual Action Vent with 4psi spring. Connection sizes vary per type. Color is Black. 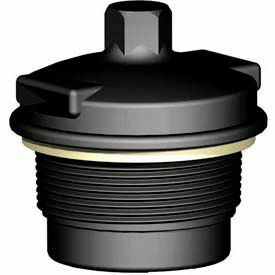 CPP IBC Fill Port Caps Are Designed For Use With IBC Totes And Drums. 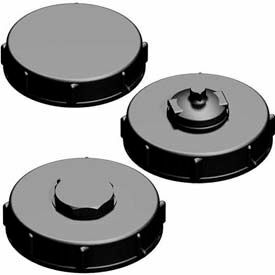 CPP IBC Fill Port Caps are made of polypropylene for long lasting durability and dependability. Manufactured from food grade LDPE material under ISO 9000 Quality Management system. 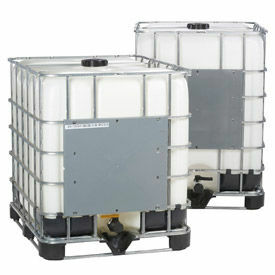 Suitable for most chemicals carried in IBC totes and drums. Available in standard gasket/seal type or with additional dual action vent, bung and bug screen features. Bug Screen for automated dual action vent also available separately. Type is Nozzle Assembly. Color finish is Black. Available with a variety of dimensions and specifications. Package quantity is 1. 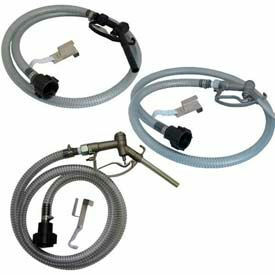 IBC Dispensing Hoses & Nozzles Are Used For Maintenance Professionals. 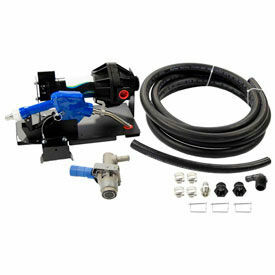 IBC Dispensing Hoses & Nozzles are made of heavy duty materials for long lasting durability. IBC Dispensing Hoses & Nozzles feature 8 or 10 GPM Dispensing Rate, 2 NPT (Male or Female) or 2 Camlock (Female) Thread, and fits 15/30/55 Gallon Drums or IBC'S/Totes. CPP IBC Trigger Nozzles, Hoses And Adaptors Provide Secure Liquid Dispersal Applications. CPP IBC Trigger Nozzles, Hoses And Adaptors are made with a polypropylene and PVC construction for long lasting durability and dependability. 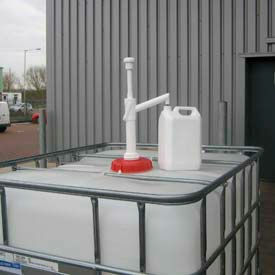 Dispenses chemical in safe and controlled way from any industrial Drum or IBC Tote. Assemblies include 3/4 or 1 inch diameter nozzle with solid stainless steel parts and secure Viton seals, 10 foot chemical hose of black reinforced food grade PVC and 1 inch female camlock or dry-shut valved coupler. Can be connected to 1 inch male adapter. 24 or 32 gallons per minute flow rate. Threads, valve couplers, connections, adapters and extension hose kits also available. Type is Nozzle Assembly. Color finish is Black. Available with a variety of dimensions and specifications. Package quantity is 1. Centrifugal Pumps for IBC's & Totes Are Used For Maintenance Professionals. Centrifugal Pumps for IBC's & Totes are made of heavy duty materials for long lasting durability. Centrifugal Pumps for IBC's & Totes feature 2 NPT (Male) Thread, 47" Suction Tube, 1" or 1-1/4" Discharge Spout, 110V or 220V Power (1/2 or 3/4 HP Air Motor also available) and a variety of dispensing rates. Progressive Cavity Pumps for IBCs And Totes Are Used For Food Industry Applications. Progressive Cavity Pumps for IBCs And Totes are made of 316 stainless steel and sanitary PTFE or Buna for long lasting durability. Progressive cavity design delivers continuous flow of material with little product degradation. Large type acme thread design enables operator to disassemble pump quickly for cleaning, maintenance, and inspection. Capable of pumping compatible liquids at -20°F if not frozen. Works on compatible liquids with temperature as low as 32°F. Provides 7 or 12 GPM dispensing rate, a 47 inch suction tube, 2 NPT (male) thread and a variety of power sources and speeds. Thread is 2 NPT (Male). Dispensing rates are 7 GPM and 12 GPM. Inlet diameter is 2 in.. Suction tube diameter is 47 in.. Power and speeds vary per model. 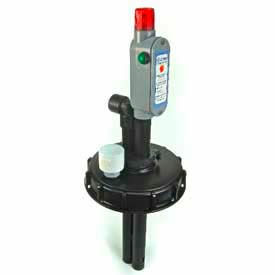 Gizmo IBC Alarms Notifies Users When Liquid Is Low. Gizmo IBC Alarms are made of polypropylene to provide long lasting durability. Alarms are built for wet and corrosive environments. A flow indicator is built in the low level alarm and flashing led and loud beeper alerts users to problems or issues. Available types are IBC High Level Tank Alarm w/Feed Pipe, Threaded Plug Mount, and IBC Low Level Tank Alarm w/Feed Pipe and Flow Indicator. Safe, waterproof and no wetted metal parts. 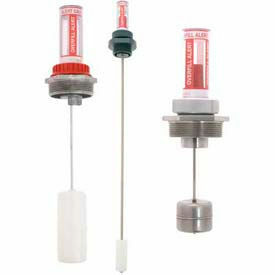 The flow indicator povides convenience in monitoring flow. Llithium battery lasts for years. Tubing connections are 3/8", 1/2", 5/8" or 3/4". Dimensions vary per model. Krueger Sentry® At-A-Glance® IBC/Tank Overfill Alert Gauges Are Used For Visual Monitoring Of Near Fill Capacity. Krueger Sentry® At-A-Glance® IBC/Tank Overfill Alert Gauges are made for long lasting dependability. High level gauge provides visual alert that IBC/Tank is near full. Simple pop up mechanical design promotes easy installation, maximum durability and low up front costs. Various types are constructed of Aluminum, PVC and Stainless Steel bushings, Galvanized Steel, Peek Plastic and Stainless Steel rods and Polypropylene, HDPE and Stainless Steel floats. Wide selection of 2 inch diameter, 10, 12, 14 and 16 inch height units are available with 6, 8 10 and 12 inch working depth and 3/4, 1-1/2 and 2 inch NPT thread. 1 year limited warranty for manufacturer defects. Note: Other construction and size options are available for custom order. Please Call for details. No minimum order required. 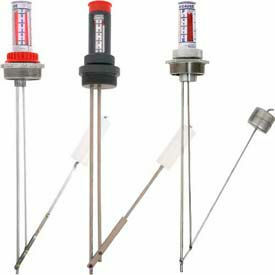 Krueger Sentry® At-A-Glance® IBC/Tank Liquid Level Gauges Are Used For Measuring All Types Of Liquid Levels. Krueger Sentry® At-A-Glance® Drum Barrel Gauges are made for long lasting durability and dependability. Swing arm type mechanical design promotes minimal maintenance, quick installation and easy, economical repairs. Monitors the levels of various liquids including phosphoric acid, sulfuric acid, hydrochloric acid, chlorine, bleach and more. Can accommodate any size tank from 6 to 110 inches in depth and can also account for double walls and pipe risers. Various types are constructed of Aluminum, PVC and Stainless Steel bushings, Galvanized Steel, Peek Plastic and Stainless Steel rods and HDPE and Stainless Steel floats. Wide selection of 2 inch diameter, 28 to 76 inch height units are available with 24 to 72 inch maximum working depth. 1 year limited warranty for manufacturer defects. Action Pump IBC And Tote Diaphragm Pumps Are Used For Applications Including Agricultural, Industrial, And More. Action pump IBC and tote diaphragm pumps are made of high quality materials for long lasting durability and dependability. Pumps are used for agricultural chemicals, herbicides, insecticides, fertilizers, and more. Units accommodate both low and high viscosity fluids for application versatility. EPDM seal pump is self-priming and may be dry ran with internal bypass. Thermally protected motor prevents overheating for unit stability. For use with IBC Totes, IBC Totes or 15, 30, 55 Drums, and IBC Totes or 55 Drums. Power options are 12V and 110V. Dimensions vary per model. 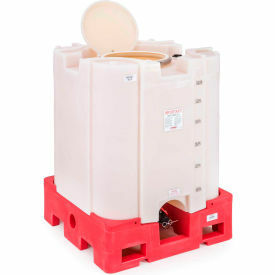 Stackable IBC Accommodates Sanitary Bulk Packaging For Loose Content Handling and Transportation. Stackable IBC protects and disperses various granulated contents. Bottom drain valve allows for easy dispersal. Select units feature a cylindrical inner tank design for ease of maintenance upkeep. Specifications vary per model.